Kiss of Death by Lauren Henderson. A Scarlett Wakefield Mystery. Review: Engrossing is a great word to describe Kiss of Death by Lauren Henderson. From the first word of the book, readers are completely engrossed in the story. Kiss of Death is the fourth book in the Scarlett Wakefield series. Readers might want to read the first three books in the series. They are Kiss Me Kill Me, Kisses and Lies, and Kiss in the Dark. 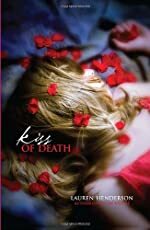 Kiss of Death is an amazing book about life, love, and death. Kiss of Death is about Scarlett's fairly complicated life. For starters, her boyfriend rides away on his motorcycle because of family problems. Then Scarlett is nearly killed by someone and is upset and brakes up with Jase her now ex-boyfriend. Then she goes to a party with her friend where they run into her ex-boyfriend who saves her from plummeting to her death. Who is trying to take her life? Will she live long enough to figure out her romantic troubles? Kiss of Death is a great book. Anyone who likes realistic fiction, romance, and mystery would die to read this book. This is because Scarlett's life gets pretty complicated in this book. The nonstop action and suspense keeps readers engaged from page one all the way to the end. Also Lauren Henderson is an awesome author because of all the twists of events. Readers are kept on their toes never quite sure what is going to happen next. We would like to thank Random House for providing a copy of Kiss of Death for this review. Have you read Kiss of Death? How would you rate it? Nice review Caitlin! Have you read the other books in the series? I also had an opportunity to read and review this book, and I think your comments are spot on. Here's what I said in my review: "The situations in which Scarlett finds herself — both the amusing ones and the frightening ones — are exciting, the Scottish setting adding an atmosphere of adventure and intrigue."